Jellies, jams and conserves packed with sugar and spice are gifts that are welcomed by almost everyone. They bring glowing color to the table and add zing to savory dishes as well as to sweet ones. Consumable treats in recyclable jars are a sustainable way to say happy holiday and they don’t need to be dusted. Even though berry season has passed, the wild grapes are gone and any apples still on trees belong to hungry birds or deer it’s possible to make preserves with dried fruits like apricots, peaches, raisins and seasonal fruits like cranberries, oranges, lemons and grapefruit. The addition of spices, herbs, vinegar or liquor makes these gifts from the kitchen special. I washed three medium oranges, quartered and sliced them, peel and all, as thinly as possible. I combined the orange slices with four and half cups of water in a medium, stainless steel saucepan, covered it and left it on the counter over night. The next morning, I brought the mixture to a boil, covered the pot and reduced the heat to medium. After the oranges had simmered for fifteen minutes, I added two cups of cranberries, a third of a cup of fresh rosemary leaves and four whole cloves. I simmered this mixture for an additional twenty minutes, covered, until the cranberries and oranges were very soft. I lined a colander with two layers of cheesecloth, set it over a large bowl and ladled the fruit mixture into the colander. After a couple of hours most of the juice had dripped into the bowl. I pressed the fruit gently to squeeze out the last few drops but resisted the urge to squeeze the cheesecloth because pulp would make the jelly cloudy. I measured the juice, put it into a large saucepan and brought it to a boil. I added an equal quantity of sugar, three cups of juice required three cups of granulated sugar, boiled the liquid, skimmed off the foam and cooked it over medium heat until the thermometer read 220º F.
I ladled the hot jelly into small jars that had been washed and sterilized in boiling water. Rather than sealing the jars by processing in boiling water, I sealed each jar with melted paraffin wax. When the wax had hardened and the jelly cooled, I labeled the jars and stored them on a cool shelf in the pantry. This recipe made four cups of jelly and it can be doubled. 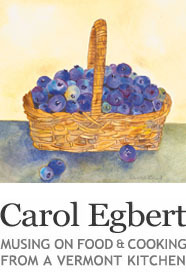 It’s best to cook the jelly in small batches; three cup of juice with three cups of sugar is ideal. Many recipes for jelly suggest that it be cooked until ‘sheets’ or passes the ‘jelly test’, but I’ve never succeeded with that method so I use a candy thermometer. 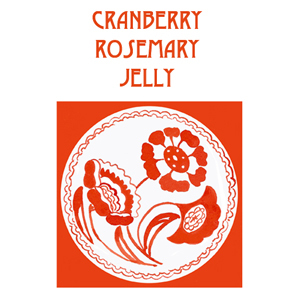 Click here for a link to Jam, Jelly & Conserve labels to down load and print.